The Racer Buggy has a three wheel strong steel frame. 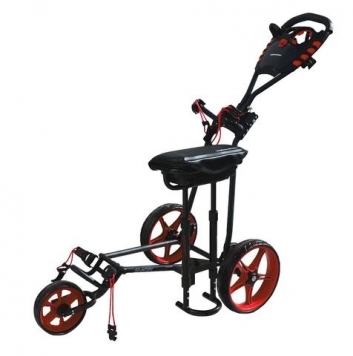 Fast release low profile wide 11.5″ tri mag wheels with 8″ front wheel provide a smooth ride. Padded seat with lift up storage compartment. Front wheel with adjustable tracking mechanism to keep buggy running straight. Wide soft grip handle can be easily adjusted to required height. Deluxe scorecard holder with lift up storage compartment. Fast action bungee straps hold your golf bag firmly in place. Footbrake provides full control of buggy. Attachment to add umbrella holder.